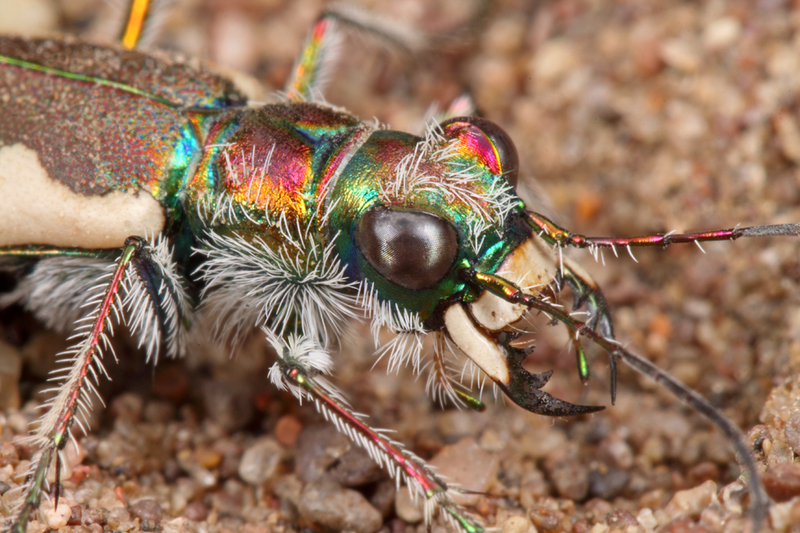 Last year’s Annual Fall Tiger Beetle Trip entered its last day as an unqualified success. Travel partner Jeff Huether and I were doing the “Great Western Sand Dune Tour” on a quest to find and photograph some of North America’s most geographically restricted tiger beetles. 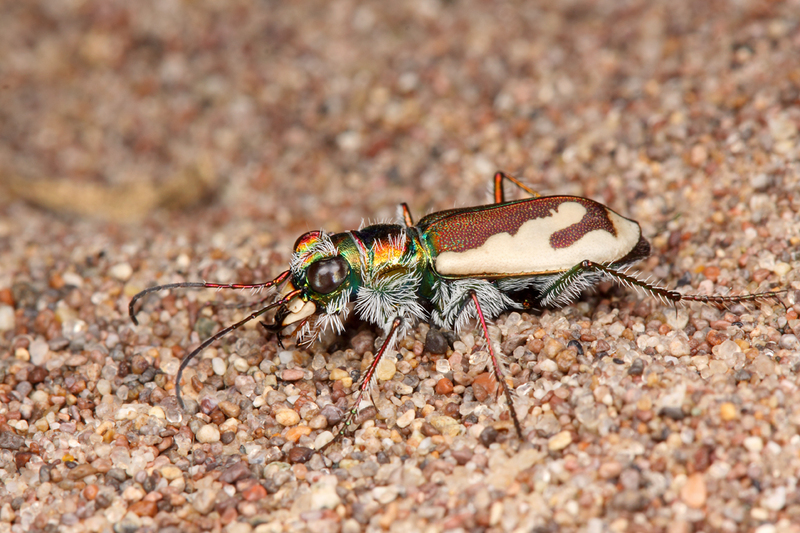 The first four days featured successful visits to northwestern Colorado’s Maybell Sand Dunes for Cicindela scutellaris yampae and Cicindela formosa gibsoni, southeastern Idaho’s St. Anthony Sand Dunes for Cicindela arenicola, and southwestern Utah’s Coral Pink Sand Dunes for the prize of the trip—Cicindela albissima. The only endemic that we had failed to find was Cicindela waynei at southwestern Idaho’s Bruneau Sand Dunes (hopefully this was a result of poor fall emergence conditions rather than an indication of further decline of this perilously endangered species). 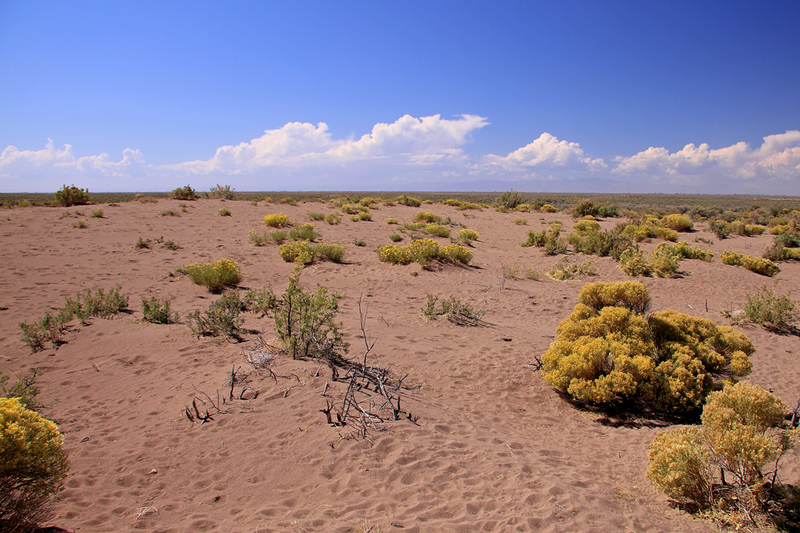 Small sand dune west of GSDNP in the Nature Conservancy's Medano-Zapata Ranch. Day 5 featured a visit to southwestern Colorado’s Great Sand Dunes to look for the endemic Cicindela theatina. As on every day previous of the trip, the morning drive saw cool but rising temperatures under bright, sunny skies, so we were optimistic about our chances. 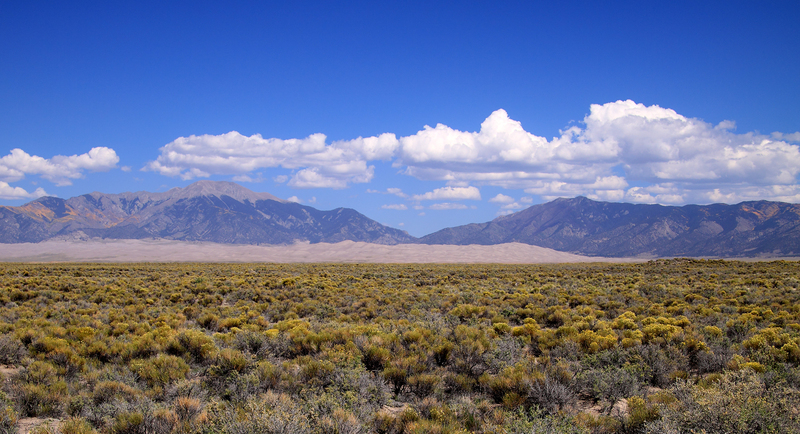 Between Great Sand Dunes National Park (type locality of the beetle) and The Nature Conservancy’s Medano-Zapata Ranch west of the park, the entire 290 km² range of C. theatina is on protected land. Not knowing whether the beetle would be out and, if so, how extensively it would occur, our plan was to approach the Park from the west through Zapata Ranch and stop at any sand dunes we sighted along the way until we found the beetle. It didn’t take long—as soon as we entered the Ranch we began to see small sand dunes in the distance, and within minutes after making the 1-km hike towards one particularly promising looking dune we saw the beetles. Even though this was the fifth western sand dune endemic I had seen in as many days, the first moment I laid eyes upon it was no less exciting—flashing red and green on coppery, white marked elytra, it seemed all hair and teeth! Despite this being my first sighting of the species, there was no doubt about it’s identity. 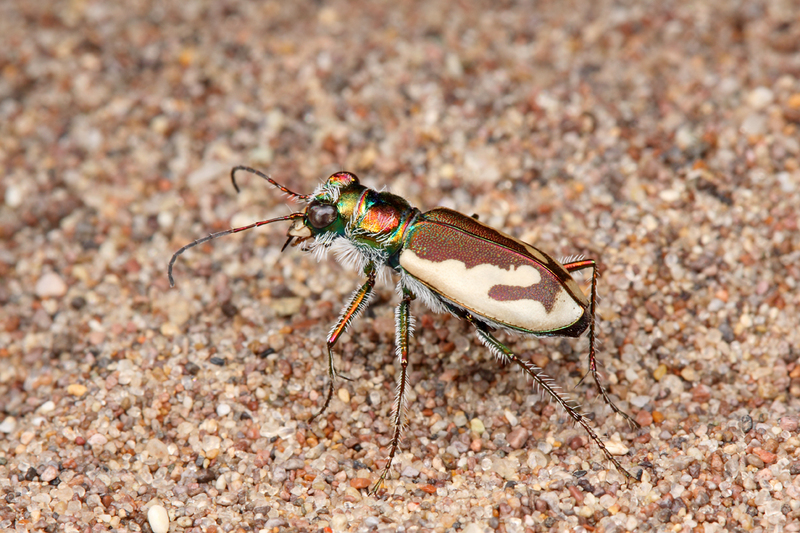 The only other tiger beetle that occurs with and could possibly be mistaken for C. theatina is the blowout tiger beetle, C. lengi; however, the broad marginal band that runs completely around the elytra and the green/brown dorsal coloration of C. theatina are enough to distinguish it from that species. Temperatures were still a bit on the cool side, but the beetles were already remarkably active and skittish. Like the other sand dune species we had already seen, they were enormously difficult to approach—numerous failed attempts were necessary before I encountered the slightly more cooperative female shown in these photos (although she still required several minutes of stalking to get her sufficiently accustomed to my presence to allow these shots). Like most sand dune tiger beetles, adults are densely hairy on the lateral and ventral surfaces. Adults ''hug'' the sand for warmth during the cooler morning hours. The dense covering of white hairs on the lateral and ventral surfaces of the adults belies their adaptation to the abrading sands of their wind-swept habitat. Scouring sands, however, are not the only hardships that the adults must contend with. Temperatures on the dunes can range from as low as 40° F on a chilly morning to nearly 140° F during the heat of the day. Accordingly, much of the adult beetle’s activities revolve around thermoregulation to maintain optimal body temperatures for activity (Pineda and Kondratieff 2003). These include not only stilting, shade-seeking, and mid-day burrowing to avoid excessive warming (see my post Tiger Beetles Agree—It’s Hot in Florida! for examples of these behaviors), but basking to gain warmth when temperatures are still a bit too cool for effective foraging (photo above). Fabulous metallic red and green highlights on the head and pronotum contrast with the reddish brown elytra and their white lateral markings. For the first time in BitB Challenge history, we have a 4-way tie for the win. Dorian Patkus, Mr. Phidippus, Mike Baker, and David Winter all share the honors for ID Challenge #15. Mr. Phidippus is the big winner, however, as he strengthens his grip on the overall lead with a lead of 13 or more points over his nearest rivals (Roy, Tim Eisele, Mike Baker, and Dennis Haines). The competition is far from over though—a single misstep is all it would take to see the emergence of a new leader before this session is over. Pineda P. M. and B. C. Kondratieff. 2003. Natural history of the Colorado Great Sand Dunes tiger beetle, Cicindela theatina Rotger. Transactions of the American Entomological Society 129(3/4):333–360. This entry was posted in Cicindelidae, Coleoptera and tagged beetles, Colorado, conservation, endemic species, entomology, insects, nature, science, The Nature Conservancy, thermoregulation, tiger beetles. Bookmark the permalink. Lovely post Ted! Makes me miss Colorado a lot too… Been feeling that a lot recently! The lighting is so good on the tiger beetles. Are you still using the same diffusion method you posted about before? Same setup – DIY concave diffuser on the 100-mm lens for the full beetle shots and Puffer + Sto-Fen diffusers with the 65-mm lens for the super closeup. I may have been using the extension tubes with the 100-mm to decrease the subject working distance (= better light quality). I don’t know much about photography, but I’m quite impressed by the clarity of these photos. Especially the last one! Do they actually get accustomed to a photographer’s presence (i.e. get less skittish after you’ve been around for a while)? Thanks FF. Some individuals are slightly more cooperative than others. I generally have to stalk several without even getting close to firing a shot before I find one that I can get within striking distance. Once I do, I know that if I continue to ‘work’ the beetle it will usually become gradually accustomed to my presence and allow me to close in for shots like the ones I show here. The only reason I could manage something like the last one (using a 65-mm 1-5X macro with very short working distance) is because the temps were still a bit on the cool side and the beetle was still trying to bask for warmth – had it been up to full temp there’s no way it would have let me get that close. That makes sense – in my very limited experiences with tiger beetles, which I think were always in the field around the hottest part of the day, it was hard enough to catch one let alone take a picture of it! The clarity and color in the final photo is amazing. It does far more than any written description could ever hope to in terms of explaining how the beatle functions. Thanks, as always, for posting these great shots. And yes, these shots are awesome, as usual. I love the panoram of the dunes and surroundings. Every time you post habitat photos, I want to go there! These pics are great, Ted. 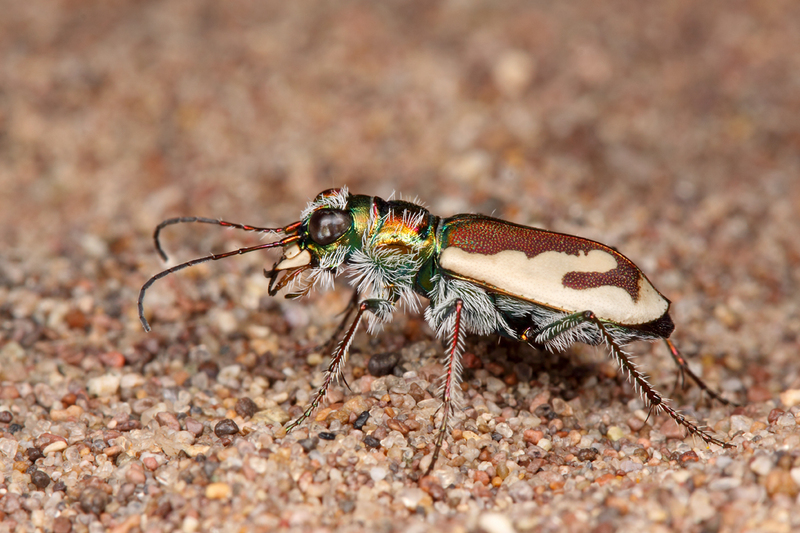 You’re amassing quite the portfolio of rare tiger beetle photographs. I also love the shot of the dune fields from afar. It’s gonna be hard to top this past year! These really are amazing. Love the color and highlights on the last one! I’m way jealous. Love the photographs! Great stuff! Thanks, Sean. I have actually made three fall trips (2007, 2008, 2010) to photograph tiger beetles in your great state. Love the Sand Hills! Wonderful photos! I wish we had something that colorful when we were putting together our guidebook. We had no idea they could be that spectacular.